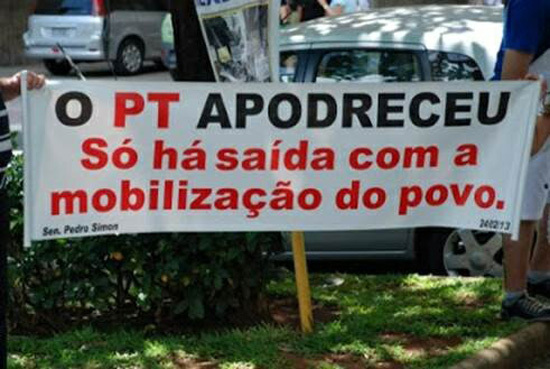 Thank you for publishing the article “Fed up with Democracy.” Being a Brazilian, I confirm what M.R. Fiuza wrote. 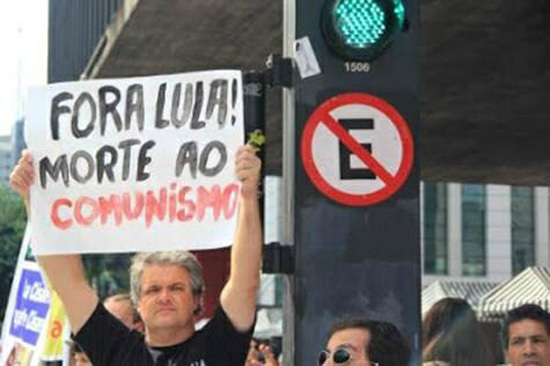 Actually, there is a strong reaction against the previous two terms of Lula as President. There is a general talk that he stole a lot of money. Actually, he did not have anything before being elected, and now he and his son are very wealthy entrepreneurs. The same Worker Party of Lula made Dilma RousseffPresident. She is not only following the same path, but under her the corruption is increasing. Today Brazil is hosting the World Youth Day; shortly it will be hosting the World Soccer Cup, then it will be the Olympics. These events are giving pretexts for huge public works projects, which open an easy way for politicians to fill their pockets with public money. This decade-long corruption has increased the general discontent in my country. Below are some photos of placards in the demonstrations. 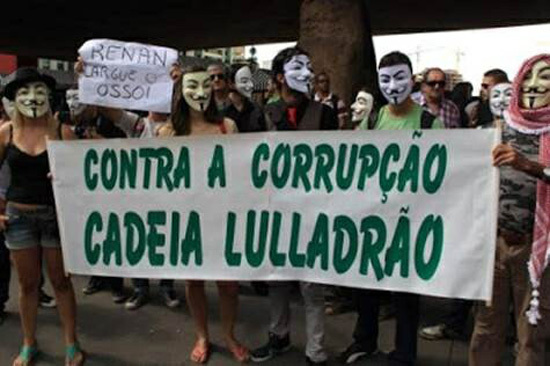 They are against Lula, the Workers Party and the present day government. Greetings to all from Quebec, where the Basilica of Ste-Anne-de-Beaupré unfortunately will not be offering the appropriate homage to the Beloved Mother of Mary Queen of Heaven and Earth during the present Novena, nor on the Feast Day [July 26]... if past experiences there are any accurate indication! I came across this archive photograph, which appears on the cover of the book for sale on Ebay, and I believe it speaks for itself [regarding the two Sister Lucys], as one considers the two parties who are 'hand-in-hand'. Or perhaps, 'hand-in-glove' also applies. Fakery of all kinds is in evidence. Thank each and every one for your continuing labors for Catholic truth in our time. I found your site recently and thank you for the work you are doing, it is more than you know. Regarding the sound tracks of the WYD	in Brazil you posted, I wanted to let your readers know that there is a very good series of CDs titled Music and Morality by Fr. Basil Nortz that explains very well why rock music is dangerous and bad for youth. Parents who are thrilled that their children are going to the WYD to listen to rock and dance should listen to this. Thank you for this article on St. Macrina that so nicely clarifies the beautiful role of women in the family and society and the importance of having appropriate companions for women, something that has been lost to such a large degree in our present society. Why Traditional Doctrine on Ecumenism Has Been Disregarded? I have a question about Church history. My background: I think that one of the signs that should make us really suspicious about the new doctrine (which is being spread by the conciliar popes) is that the documents presenting these novel ideas often don't reference the previous documents that explained the different (or even opposing) old teaching. Then 36 years later, Unitatis Redintegratio (promulgated in 1964) starts to (implicitly) encourage the same errors - doing this without even a single mention of the previous documents that deal with the ecumenical movement and other religions. There is not even a footnote referencing Mortalium Animos in the new document, much less any refutation of the previously offered reasoning. I would assume that the frank and just way to change any previous teaching (which can be possible in theory, if we are talking about non-infallible documents) would be to reference the old document, analyze the reasoning in them, point out exactly where the error is, where the misunderstanding comes from, and then proceed to explain the new, corrected doctrine. But this is not the way conciliar popes seem to be doing it. They just give us the new teaching, completely ignoring the old one. They don't refute or retract it, just let it sink into oblivion. In my opinion, this fact alone should be a very serious warning flag, for all intellectually honest onlookers. If such a case existed, it would be great if I could use it as a reference point, or illustration, when describing (to not-yet-traditionalists) the absurdity of the new way of doing things. Thank you for your question. Our answer follows. We believe your background is correct. The conciliar Popes, if they were well intentioned, should quote Mortalium animos and explain why its express norms forbidding relations with non-Catholics should no longer apply. It seems to us that they do not do so in order not to show their blatant contradiction with the previous Magisterium. Regarding dogmatic doctrine that is still not infallible, there is liberty to discuss it until the Church pronounces her definitive sentence and closes the question. One classical example of this is the discussion on the Immaculate Conception of the Virgin Mary. Until Pope Pius IX declared this doctrine a dogma, there was liberty to dispute it. So much so that St. Thomas Aquinas himself was against it. However, at the moment the Church declared it a dogma, all the other opinions were overridden, and Catholics cannot deny it or dispute it. However, in practice, in the 1,962 years before Vatican II we find no example of a change in meaning of any dogma of the Church. 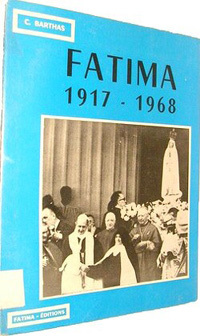 This topic of the evolution of dogma - either in theory or in practice - was addressed by Atila S. Guimarães in Will He Find Faith, volume VI of his collection on Vatican II. This matter is studied in chap. IV, pp. 151-162 of the TIA English edition of that book. You may benefit from reading it. Is the Catholic Church the Church of Christ?